Last weekend I decided to go to the Sacred Valley. It is one of my favorite places to visit. Here I can easily escape from the daily chaos of Cusco. I am always impressed by how calm and relaxed I get while visiting this particular area of Peru. The area has amazing landscapes, the weather is (almost) always very nice and the people are very friendly. We booked a hotel ten minutes outside of Urubamba. The hotel was absolutely beautiful and the landscape views were stunning. It is only a one hour bus ride from Cusco to Urubamba and from Urubamba to Ollantaytambo does not even take 20 minutes. The next morning I took a taxi to Ollantaytambo and arrived at the Plaza de Armas around 11am. Ollantaytambo is located in the heart of the Sacred Valley of the Incas and this small town is definitely worth the visit because of its interesting history and culture. Ollantaytambo is located at a height of 2,792 meters above sea level. Since te time of the Incas the town continues to be inhabited by the native population. Ollantaytambo is a remaining example of an Inca town that has reserved its original architecture with charming streets, irrigations systems and Inca aqueducts that are currently still functioning. It was very quiet on the Plaza de Armas. I sat on a little terrace and enjoyed a delicious lunch and a cup of coffee. 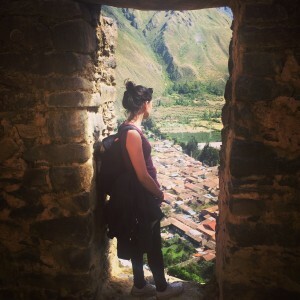 I did not plan to visit the Ollantaytambo ruins since I did not purchase the Boleto Turístico (a tourist ticket needed for mainly all touristic attractions in the Cusco area). Luckily you are able to visit the Pinkuylluna ruins for free. The Pinkuylluna ruins are located on its namesake; Pinkuylluna Mountain on the other side of the town. The ruins were supposedly used as storehouses. The high altitude location causes more wind and lower temperatures. This defended the contents of the storehouses against decay. To reinforce this effect, the storehouses feature ventilation systems. What was stored in the houses will remain uncertain but it is believed that they were used to store the production of the agricultural terraces built around the site. It is a short hike of approximately 30 minutes. 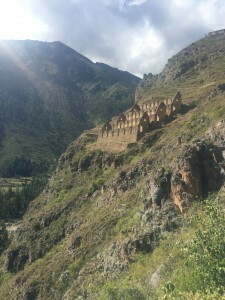 Once you reach the storehouses it gives you spectacular views of the Ollantaytambo town and ruins. I sat in the sun for more than an hour before I made my way back to the town. If you are interested in hiking up the Pinkuylluna ruins I would recommend doing this before 2pm. Before this time you will have the sun shining but not too bright. The view of the Ollantaytambo ruins located on the other side of the town is more beautiful because of the sun light. Also, temperature drops pretty fast when the sun goes down. 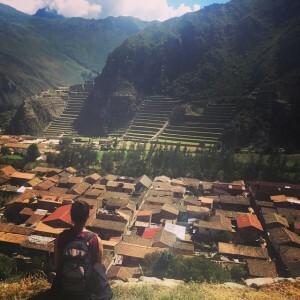 I had a blast visiting the Sacred Valley and will definitely return to visit the Ollantaytambo ruins.